The dentists recommend that you must replace your brush after every 3-4 months at the least. You may notice that after some time your once new brush head begins to look old and frayed. The bristles that were once straight will now be pointing in every direction. Oral B Dual Clean brush heads 3 pack helps you remember that through its refill feature indicator bristles. It fades halfway so that you know it is time to get Oral-B Dual Clean replacement electric toothbrush heads. Knowing how to replace Oral B Dual Clean head properly and in a timely manner is paramount for your better dental hygiene and health. And fortunately, Oral-B brush heads are less expensive than other brands (on average). Dentists’ no. 1 recommended brand, Oral-B is used by Dentists worldwide. The Dual Clean replacement toothbrush head comes with two movable brush heads. One section of bristle moves side-to-side while the other one oscillates and pulsates. The Dual Clean toothbrush provides twice the cleaning action and can even reach hard-to-reach areas for a comprehensive clean-up. It is made possible by delivering a thorough removal of plaque, mouth freshening and by providing complete gum care. The Dual Clean employs the unique Oral-B technology which allows the bristles to completely surround each tooth inside your mouth for a wonderful tooth-by-tooth cleaning action. The Oral-B replacement heads are compatible with all available varieties of Oral-B rechargeable handles with only Oral-B sonic toothbrushes as exceptions.These brush heads need to be replaced every 3 months, or earlier. The Oral-B Dual Clean is one of those products that you will either love or hate. The Dual Clean is a combination of the smaller round Oral-B heads and a second head that moves side to side. These heads could work each tooth individually with the help of the round head that is inside. Meanwhile, the outer second action head concentrates on working on the gum line and the areas that lie in between the teeth. For some, the size of the brush heads could be a downer as it is the largest Oral-B brush head. In spite of that, many had experienced the best cleaning of the teeth. Another downside to this brush head is that there is a dead space between the top and the bottom brush which has no bristles. This, as a result, leads to a missing surface area while cleaning. Why Oral-B Dual Clean Toothbrush Head And How Is It Different From Other Oral-B Electric Toothbrush Heads? When it comes to choosing the right toothbrush, Oral-B has been a worldwide leader that provides a thorough, full-mouth cleaning, and fresh feeling in your mouth. It also provides several varieties to choose from according to your preferences and needs. Each of the Oral-B electric toothbrush heads offers different types of cleaning. The Dual Clean has dual movement brush heads, i.e. side by side and rotating. The Oral-B Sensitive brush heads are for gentle, yet effective, cleaning. Oral-B 3D White for removing surface stains. The Floss Action brush head employs MicroPulse bristles that provides deep penetration in between teeth for a thorough plaque removal. Oral-B Deep Sweep bristles allow you to brush your teeth as you would with a regular manual toothbrush. Oral-B Precision Clean is for precision cleaning and more plaque removal along the gumline. Oral-B Power Tip cleans areas in between the teeth, as well as around the bridges, crowns, and the implants. Ortho is specially designed to safely clean around the braces. If you prefer to shop in person then you can get replacement brush heads from your local pharmacy or local general stores or malls. 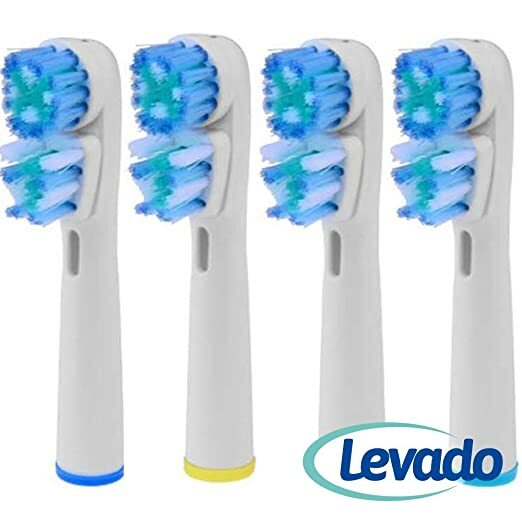 The Oral-B Dual Clean brush heads can also be bought online from Amazon or from this site Amazon often offers discount coupons and you can even subscribe and set up regular delivery in simple steps. You can find many generic brands at much cheaper prices to replace the official Oral-B brush heads. Such deals are hard to resist especially for frugal buyers and when you are short of money. But when it comes to toothbrush heads, Oral-B cannot be replaced in its quality and standards as the brush heads under generic brands become faulty after only a few weeks and the bristles start falling out while brushing. In such cases, the generic brush heads prove to be more trouble than its worth. The good news for those who are on a tight budget is that the Oral-B frequently announces discounts on their ranges of brush heads. Stock up electric toothbrush heads when they go on sale at once as the brush heads need replacing once every three months only. So, if you buy four brush heads at one time, they will last you for a year. All we can say is: Try for yourself. The Oral-B Dual Clean toothbrush head is definitely worth checking out. It is not recommended for children under the age of 3 but you can read more on buying kids electric toothbrushes here to get the right toothbrush for kids. I try to make sure that I get a new brush every 6 months but I love that this one helps you to remember by fading! I definitely will look into these brushes! We are all guilty of forgetting to change toothbrushes once in a while.thanks for stopping by. I used to be a dental assistant and the dentist I worked for always recommended an electric toothbrush. Looks like they’ve come a long way since then! I like the fact that there’s a visual indicator for when to change the head! I`m sure in years to come, electric toothbrushes will continue evolving and soon no one will forget to replace the heads. Looks like a very promising product! Dental care is so important, it’s definity worth the investment! I’ll have to check out the amazon shop you suggested, see if the ship to my country! True,shipping can be costly but Amazon do have free shipping to some destinations. I love that this toothbrush indicates when it needs to be changed. Looks like a wonderful investment. Hope you`ll give this electric toothbrush a try next time you purchase new toothbrush. I really like this idea of reminding about changing as it fades. Thanks for sharing! I love electric toothbrushes and could never go back to regular. It’s amazing how much cleaner they leave your teeth! I agree with you, I first tried electric toothbrush about 10 years ago and asked my self “where have they been all along” it`s an experience when you start brushing with electric toothbrush. I’ve been thinking whether I should be getting an electric toothbrush! They do sound a lot better. Electric toothbrushes do not only sound better, they work much better at cleaning teeth. I get a new manual brush every 3 months a new auto head every 6 months. Love Oral B. Well done, most people do forget or ignore to change toothbrushes. Its been more than 6 months when i changed my toothbrush. It is so important to do that. Thanks for reminding me. This Oral B Brush looks really nice. Thanks for stopping by, glad you liked the post.We should regularly change toothbrushes if we are to achieve expected results. I love that this toothbrush indicates when it needs to be changed. its a a very useful feature. Thanks for stopping by glad you found some useful info here. I haven’t switched over to the electronic toothbrush, but you offer some compelling arguments here! I’ve been wanting an electric toothbrush for so long, but have yet to actually get one! I need to do it already. sure you will choose the best when you get one everything at its own time.